We've been hard at work on this volume for several months now, and hit a few snags with artwork that are now resolved. GPS has added two new authors for this volume, and all your favorites from volumes 3 and 4 have returned to bring you brand-new stories. So what is this volume about? Life is full of surprises. Sometimes changes upend everything we thought we knew, inverting our perceptions of the people and world around us. Part of the joy and terror of living lies in experiencing these inversions. 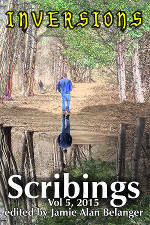 Scribings, Vol 5: Inversions presents eight stories from the Greater Portland Scribists, each with its own hidden twists and surprises. A former rock star who can no longer sing. Escaped convicts with much to atone for. A strange boy with an affinity for plants. Gods watch mortals make a seemingly simple choice. Tiny shoe prints lead to a birthday adventure. A hostage tries to salvage a botched bank robbery. A soldier flees war only to find it follows. And a quest for a missing corporate department that may actually be hiding. We are still waiting on the paperback proof, but the ebook is ready to go for a July 30th release at $3.99. But you can preorder a copy today for $2.99 ! You can also check iTunes, Barnes & Noble, and Kobo over the next few days for preorder pages. Plus, we're doing another GoodReads Giveaway this year. You can win one of 8 paperbacks, signed by all of us. The Giveaway ends on August 24.